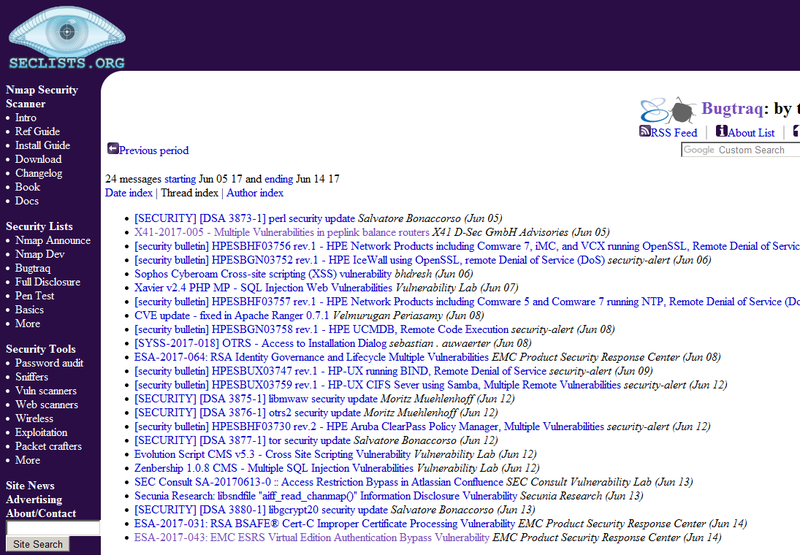 Everything is Vulnerable – Even Security Software! Some great points are presented and I especially appreciate how the fact is hammered in that attackers shift focus whenever required, but as Jericho pointed out when we discussed it, “The security industry does not.” I find, however, that the blog post lacking a couple of key points, which caused me to write this follow-up (not a rebuttal – Jericho handles those). I agree that we have for decades been offered the same solution to all our security problems: Buy more/newer/subscription security software to deal with the threats. It is also certainly installed in abundance. Security software does present problems however, and these concerns are not new. Researchers have voiced concerns for years over security software like firewalls and especially anti-virus (AV), pointing out that businesses are adding more (potentially flawed) code to protect themselves. It’s a common rule of thumb that the more lines of code, the more vulnerabilities. Reducing attack surface by adding an even greater attack surface is a paradox. While security software in general presents an interesting target, it does, however, not necessarily mean that we will see it receiving the same heavy abuse as Java, Internet Explorer, and Flash, which are currently getting hammered by the bad guys. 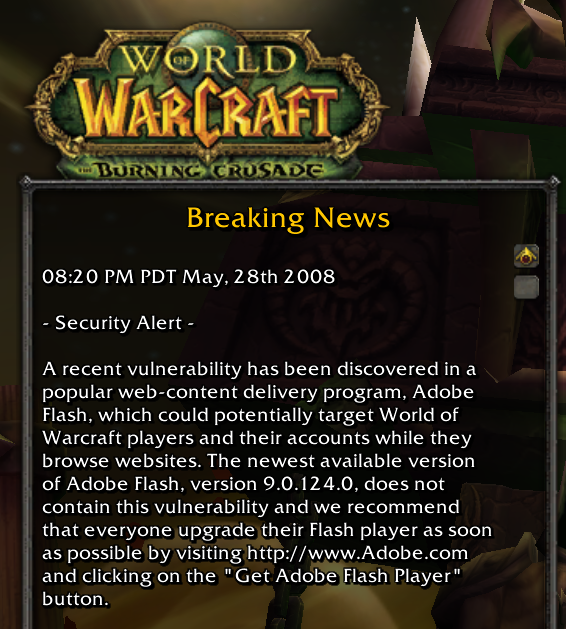 When the bad guys were exploiting vulnerabilities in Adobe Reader, they were not targeting PDF viewers overall; they did not really care about e.g. Foxit Reader, PDF-XChange, nor Sumatra PDF. When Microsoft Office was hot, other office suites like OpenOffice and Corel Office did not feel the burn. And when 0-days are being dropped in Internet Explorer, browsers like Firefox, Opera, and Chrome can relax (relatively speaking) on the side. These other products are not necessarily going free or only receiving limited attention because they are safer – they may just not have a user base that results in a profitable ROI. If history is permitted to serve as a pointer, the bad guys do not target a whole class of products, but generally specific products with an extremely high user base allowing widespread attacks. It would, therefore, be more likely to see attacks focusing on products from a specific security vendor. That would, however, require a strong position with the vendor’s products being installed on a very large scale and while security software is prevalent, no single vendor dominates the market – especially not with a single product. Another option would be if the security products start using the same codebase e.g. for file parsing or other common routines. Should security software e.g. use the same third-party parsing functionality, these parsers would certainly become of greater interest. It should also be noted that while security software has not been targeted by the bad guys in the same manner as the previously mentioned products (and currently for good reason), it has still received a fair amount of attention over the years from researchers (myself included). Looking at the OSVDB vulnerability database, it has at the time of writing 1,919 entries covering vulnerabilities in security software – in fact almost 2% of all our entries (yes, we have a specific classification flag, making it very easy to get a historical overview). These span from 2013 all the way back to 1995, when security software started gaining a foothold. I specifically remember when Alex Wheeler in 2005 was doing some serious work on the archive parsing functionality of many security software vendors’ AV solutions. For the past 5-6 years, Symantec has also had their worries because they decided to implement very flawed parsers from HP/Autonomy/Verity Keyview in some of their security solutions, including their Mail Security and Data Loss Prevention products. Or Microsoft who on a related note made the questionable decision of implementing Oracle Outside In parsers in Microsoft Exchange Server 2007 and 2010. A vendor with a history of vulnerabilities, that they have worked very hard to overcome, deciding to implement a more notoriously insecure vendor’s software is certainly interesting. Does this mean we won’t see any focus on security software in the future? Certainly not. Security software exposes a broad and tantalizing attack surface and is not necessarily built to impress (as Tavis Ormandy recently demonstrated for Sophos’ security solutions). It is an interesting target class of products that will continue to receive attention – and perhaps even an increasing focus once Oracle eventually sorts out Java, though that may take a while. When the going gets tough, attackers just change to a different target with a better ROI, and it cannot be ruled out that the target ends up being the code actually intended to protect you. So remember that 201x is already here and that while the bad guys may not go all-in against security solutions, vulnerabilities in these have been found consistently for many years. Consider what security software you really need – and certainly which features you need enabled. Symantec posted a message to Bugtraq earlier this month announcing the availability of a new advisory. 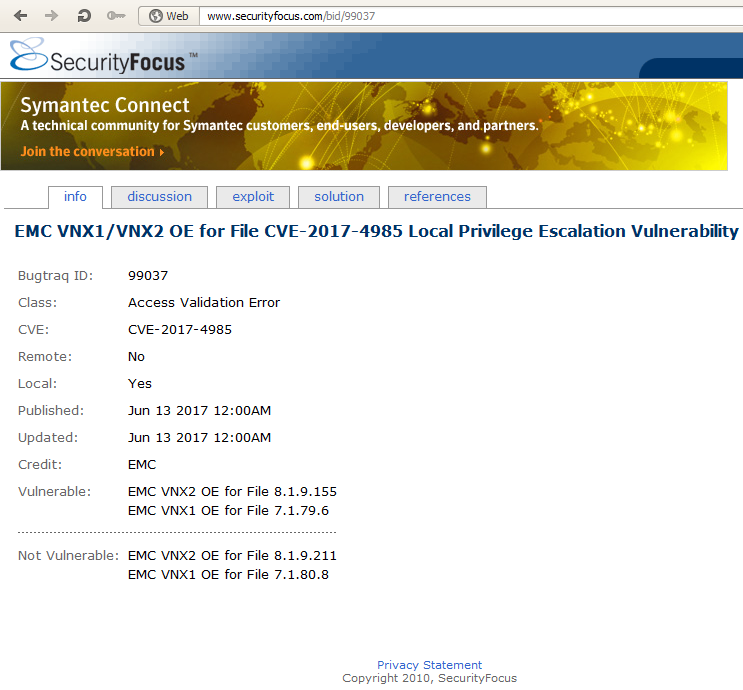 The advisory presumably covers a vulnerability or issue in Symantec On-Demand Protection. If you are reading this blog entry a year from now, that is all you may find on it. Yes, even in this day and age, not everything is archived in Google cache or archive.org! In December of 2000, Elias Levy (moderator of Bugtraq at the time) said that such posts were not acceptable because security company web sites had a habit of disappearing, leaving no trace of the information behind. Years later, Symantec bought SecurityFocus (who hosts/moderates the Bugtraq mail list) and we see this rule being ignored, and of course the approved post comes from their owner. Some may argue that Symantec is huge and won’t disappear like those other companies. Many said the same about @stake but shortly after they were purchased, their new owner (Symantec) opted to yank all of the old advisories off the web site making Elias Levy’s concerns reality. As Chris Wysopal said in reply, Symantec needs to post their advisories to the list just like everyone else. While Symantec may stick around, their web site may change or corporate policy may be altered, and that information may not be readily available in the future. Depending on how you count flaws..
MARCH 07, 2006 (IDG NEWS SERVICE) – A report issued today by Symantec Corp. seeks to satisfy users of both Mozilla Corp.’s Firefox browser and Microsoft Corp.’s Internet Explorer. 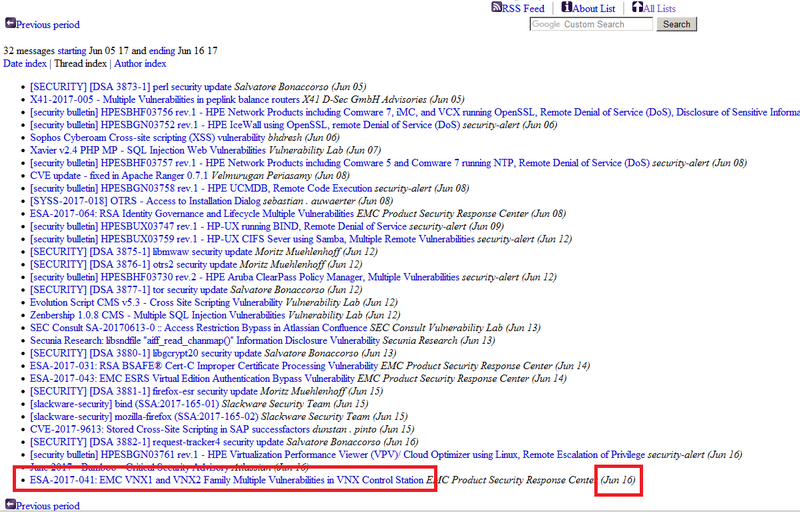 Thank you Symantec, for generating completely useless vulnerability statistics. When you can manipulate them to support either side of an argument (and do so intentionally), what’s the point? Just define your criteria for counting a vulnerability, define your time frame, and let the results speak for themselves.